Much to the relief of the entire Lent Madness global public, the Supreme Executive Committee has reconciled — temporarily — which means the Saintly Smackdown will proceed after Saturday’s all-t00-real April 1st scare. Yes, there WILL BE a 2017 Golden Halo winner. So let’s get back to the holy business of saintly competition! Today, we continue with the final matchup of the Saintly Sixteen as Amelia Bloomer faces Fanny Crosby. To get to this round, Amelia dispatched Philipp Melanchthon while Fanny got the best of G.F. Handel. The winner will join seven other saintly souls to make up the Elate Eight. Who will Amelia or Fanny be joining? Just to refresh your memory, that would be Stephen, Augustine of Canterbury, Franz Jaggerstatter, Mechtild of Magdeburg, Raymond Nonnatus, Martin Luther, and Florence Nightingale. One of this group will, soon enough, be crowned in (extra special) glory. Amelia is remembered in the church as a woman who saw women as equal and valued members of the body of Christ. She worked tirelessly in her life to invite the Church and the State to recognize the dignity of women. She was a journalist, voting rights advocate, and temperance leader, among her many roles. The forum she gave to women to speak, to be heard, and to be empowered continues to nurture all who demand dignity. Her words still ring true, and still challenge us. 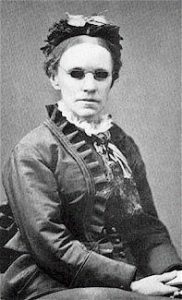 Fanny Crosby is easily given the appellations of “mother of modern American congregational singing” and “Queen of Gospel Song Writers.” Her more than eight thousand hymn texts of the late 19th and early 20th centuries make her among the most prolific hymn writers of all time. More remarkable than her myriad compositions is that she wrote all of her hymns while blind. Fanny Crosby: picture in the public domain. 204 Comments to "Amelia Bloomer vs. Fanny Crosby"
Likewise! We use gospel and bluegrass music at our services and, although raised in a High Church tradition, have grown to enjoy the direct simplicity of the music. Threes no mistaking the message. Hang on Fanny, there may be another “late surge” at the end! I was going to vote for Bloomer. But singing Blessed Assurance brought tears to my eyes and made my heart sing, so Fanny got my vote. It has been a long time since I sang it all the way through and it inspired me to vote for Fanny. A nostalgic vote for sure. As I read those words, I could hear my grandmother singing them as she worked in her kitchen, many years ago. That clinched my decision, because otherwise I couldn’t decide. Me, too! I thought Fanny would be ahead due to the inclusion of the song at the end! I’m surprised. I agree. This one was super close for me, but I went with Fanny C.
Always for me a hard choice when putting two women against each other. With so few women vs so many men, I would hope next year they would not pair up two women but maybe give the women more of a chance by pairing them with a man. Remember that both of these women got to this matchup by beating men. But two of the initial matchups did pit women against each other. I wonder how the SEC decides on those initial contests – it can’t just be puns, can it? Tune: Simple Gifts, Hymnal ’82, 554, ‘Tis the gift to be simple . . .
‘Tis the gift to discover the true gifts we’ve been giv’n. ‘Tis the gift to offer all we have to Heav’n. is joyous joining in holy dance. We honor God and reveal God’s love. Were seen as weak and frail with feeble minds. She wrote and she published and she dressed with sense. In face of scorn she persisted yet. Attention of the public to iniquity. Her work did much to set women free. Still exercised her vision true and wise. With prayer she wrote lyrics that still ring forth. Of wondrous love that can never cloy. From the depth of Being all that e’re becomes. And rose again e’en though crucified. Who guides, sings and is creativity. The Three in One and the One in Three. I love the last stanza– a beautiful prayer this morning. Praise be to God. How long does it take you to write up theses lyrics? It depends on the day, Harlie. Sometimes they just flow. Sometimes it’s hard work. Always its joy and prayer. I can’t begin to express what a gift it is when a song finally comes together and gives glimpses of what my heart is feeling. So glad you find pleasure in them, too. Add me to the list of your fans, Diana. I now check out your hymns each morning before I make my choice, hoping to be inspired by your beautiful words. Thank you! Thank you for today’s inspiration. I particularly like that last verse about the Trinity – a challenge for humans to describe – I like your take on them. Thank you Diana! It is a joy to read the hymn and try to work out the tune. By the third line the hymn starts to sing itself. You and your hymn poetry are a joy, thank you. Beautiful, Diana. I especially like the first verse. ‘Tis a gift to have you share these wonderful hymns! I still think you should published them. I’m planning to put them into a PDF format after the Golden Halo is awarded and will send them to anyone who wants the collection. I love your hymns, Diana! So happy to hear that you plan to put them in a pdf. What a wonderful idea. They are inspiring and yet, no favoritism is expressed. Thank you for sharing your gift. To be honest, Ann, the biggest temptation is wanting to put in my almost always strong opinion about the saint I prefer. Thanks for saying that I’ve succeeded in resisting. Please ask the SEC to put it up more publicly for us. I definitely want to be on your list but have lots of LentMadness participants who are asking for it as well. Please add me to your list! I look for your hymn each day. Diana, I bet Scott and Tim could put it in the Lentorium as a free download. Tim? Scott? I’d be happy to do this if you think if appropriate. I agree, Diana should publish her lyrics! She’s so talented!! Another fine one, Diana. Thank you! Best one yet, about the one match up I was struggling with. “blind only in her eyes” What wonders her mind saw. The tune was also used by Sidney Carter for “Lord of the Dance”. One of my favorites. Thank you, Diana, for your lyrics. Your hymns are such a joy. I keep thinking how nice it would be to sing some on All Saints Day. I LOVE your hymn. Thank you for sharing! Blessings, Diana. You have certainly blessed us! Thank you for this amazing set of verses. Go, Fanny! Thank you so much, Diana, for all the lyrics you have given us this year. In your honor, and because of my great love for her hymns, I vote for Fanny Crosby. I love your “Hymns for Lenten Madness” and hope you will make them available for a wider audience — they deserve to be heard in church! Thank you, Diana, I will be humming it all day long! Amelia for the Golden Halo! I voted for Fanny just because I love many of the hymns she wrote. The fact that she did it while blind makes it all the more amazing. Fanny has my vote – to live as a victorious overcomer in spite of her blindness – writing over 8000 hymns to boot – inspires me to keep my eyes (inside and out) on Christ Jesus all the more! “… you must also have a song in your heart”. “Filled with His goodness, lost in His love”. Fanny was a model for saintly living but more importantly wrote hymns that have inspired and brought comfort to thousands in the past and to come. Amelia. Because I can’t stand American gospel songs, except the spirituals. There, I confessed my blind spot. I agree! I voted for Amelia for that reason and in memory of my grandmother, a lifelong member of the Women’s Christian Temperance Union. She saw firsthand the effects of alcohol on the lives of rural and small-town women. They weren’t allowed to work except on the farm, and were dependent on the men who drank away the money and frequently were violent. Many times she walked to the next farm to help her neighbor deal with her alcoholic husband. This one’s for Carrie. There was no question in my mind this morning: Amelia all the way! We cannot fully appreciate the change in status for women as equal children of God that she advocated. Just imagine what it was really like not to be able even to vote! Fanny’s theology (God wanted her to be blind??) is extremely distasteful to me. I understood her statements about her blindness as a rejection of ableism, not theology. Remember that until very recently, people who were blind were seen as objects of pity, unable to work or live fully. (My son-in-law, whose parents were both blind, told us once that more than once our state’s Child Protective Service was called in on his family, solely because the caller was sure two blind people couldn’t adequately care for a child.) Sure, the statements are couched in terms that don’t sound great to 21st century ears, but I hear the same underlying statement that I hear with deaf communities seeing themselves as a culture, and not needing to be “cured”. It’s interesting how differently people can read the same statement – I read Fanny as saying that she (even blind) was fearfully and wonderfully made, made in the image of God and not in need of healing. For me, that’s an incredibly powerful statement. Miss Fanny today for my saintly mother. Amelia had a lot of gumption; Fanny had a lot of faith. Have to go with Fanny. How could I not vote for Amelia? Fanny! She brought beauty, joy, and love of God to all though her amazing gift from God. Isn’t that what we are all called to do? Fanny Crosby was amazing! Blind Christian woman in the late 1800s and early 1900s writing and being published in her time and still sung today now that is amazing! MAN! You fooled me all weekend! What a terribly hard choice. Thank you, Diana, for “blindness–only in her eyes.” And Blessed Assurance is the song living in my head these days. But as a journalist, although one who thinks fruit cake without brandy is tasteless, I had to vote for Amerlia. What a terribly hard choice. Thank you, Diana, for “blindness–only in her eyes.” And Blessed Assurance is the song living in my head these days. But as a journalist, although one who thinks fruit cake without brandy is tasteless, I had to vote for Amelia. I’m mad at Fanny Crosby for beating out G.F. Handel, but how can I vote for someone who sneers at cooks who put brandy in their mince pies? Advice, please! Really tough choice! In the end it was Fanny for me because of the solace and joy I often find in so many of her hymns. Amelia might have been a great feminist, but I didn’t hear much about God or Christ in her life.. at least in today’s description… which seems to me part of what saintliness is about. So sorry, can’t go for Amelia… which leaves Fanny by default. I agree. I really wanted to feel more of a contest between the two – but Fanny’s devotion to God made it an easy choice for me. In a variation on Rock Paper Scissors, I determined that Bloomer covers Fanny. But seriously, Bloomer’s witty defense of equality swayed me. Thanks for the Monday morning giggle, Alan! I will look to you for more Rock Paper Scissors determinations in future rounds. Just the laugh I needed! Thanks, Alan. Think I will go with Amelia too. Isn’t being a ‘saint’ about living a life of Christian Faith? Many have pursued social justice issues without a faith basis. Amelia’s relationship to our Lord is what? It appears that her faith is known to God alone. Fanny on the other hand’s is clear. When she prays, God doesn’t say “who is this really?” Biography of my 2nd Great Grandfather reports that he was a fan of her works. I’m hardly a Bloomer expert, but her first-round bio provides a little info about her religious life. Maybe we’ll learn more in the Elate 8. If the bracket were arranged differently, these two could have been head to head for the Golden Halo. I go with Fanny Crosby. Her impact on the Episcopal Church as well as the greater church is sung every Sunday in many different parts of the country. Beautiful hymns are a joy, but the fact that women today are participants in all aspects of a spiritual and secular life are thanks to women like Amelia. It seems to me that Amelia heard this call and spent her life answering it. My vote is for Amelia. My vote for Fanny stems in part from the hymns I heard as a child. Our congregation sang many “sentimental” hymns about Jesus and His Glory, Jesus and His Love” and I have remembered those words to this day. They give me great comfort in these troubled times. Amen! Me too! Her hymns take me to my childhood in a little country church in Mississippi. I was having trouble voting and reviewing results. Might be my computer but have not had trouble before. I gave Fanny kind of short shrift in the Round of 32 in her contest with Georgie Fred, so I’m giving her another chance this time. Bloomer’s advocacy of women’s rights is certainly commendable, but her categorical condemnation of any use of alcohol whatsoever is a little too draconian. Been annoyed by temperence rules for years, and the prohibition spawned gangsters and violence in the same way that anti Marijuana laws have created drug cartels and murder. I very much appreciate Amelia proving American clergy wrong in their interpretation of Scripture regarding women’s place in church and society, but the alcohol crusade was a bad move. I’m not a teetotaler, but I’ve seen families suffer and people die from alcohol abuse, so I do understand Amelia Bloomer’s vehemence. The brandy-in-pie remark might go too far, but if you’ve seen the face of a man whose son drank himself to death, you can imagine being a bit extreme. I’m no teetotaler, but there was a tremendous level of alcohol abuse in the 19th century that puts the temperance movement in perspective. Amelia was a tremendous fighter for justice, but a saint???. That’s why I voted for Fanny. Amelia for me! You GO Girl! I can imagine the punishment she took from both men and women for her pursuit of The Right and Just Way! women’s equality, too. I bet she would have loved bloomers. Lastly, she and I share “Amelia” as our middle name! So very hard to make this choice — I would have rather voted for a tie. That said, I had to go with active doer as opposed to blessedly gifted writer. “What does the Lord require of you … to do justice, to love mercy and to walk humbly with your God.” Only God knows the true nature of someone’s relationship with Him. But we all can see if someone is fighting for justice. So it’s Amelia for me. Amen, and thank you for this comment! Two good candidates today so I will not be disappointed with either winner. That being said, I voted for Amelia because of her activism and wit for women’s equality. As a woman I am grateful to her and other women who have made it easier for me! I was in a quandary on this one. I am 76 and spent almost half of my life teaching at a college for women. On the other hand, I was raised on Fannie’s hymns. It came down to this: in my later years I have come to question some of the theology in the hymns, the one cited in particular. Is Jesus mine? Do I somehow own him? Shouldn’t it be “I am His”? So because of the theology, and my wife’s strong opinion, I am going with Bloomer. Phil, you raised an interesting question. Thinking about it sent me into the question of relationship which sent me to a camp song. The lyrics go “I’m my beloved and he is mine; his banner over me is love.” Jesus gives himself to us in every way, including in Holy Communion, in prayer, on the Cross. At the same time we belong to Jesus, which FC celebrated: “Praising my Savior all the day long”. It’s one of the most incredible realities we celebrate as Christians – this all out Grace that enables a two-way relationship. Would be interested in your further thoughts on this. I am sad that Fanny is lagging behind. I grew up singing her hymns and still they drift in and out of my spiritual landscape like dear friends, always there at the right time. Physically blind, but spiritually a true visionnary. As a former journalist and a lover of bloomers, Amelia got my vote today and I honestly can’t remember if she did before or not …. Impossible choice! Amelia and her bloomers! According to: Amelia Bloomer, a Biography by Louise Noun (published in The Annals of Iowa (State Historical Society of Iowa) Volume 47 | Number 7 (Winter 1985) pps. 575-617): [Elizabeth Cady] Stanton and [Amelia] Bloomer traveled in different social circles and their interests diverged significantly. 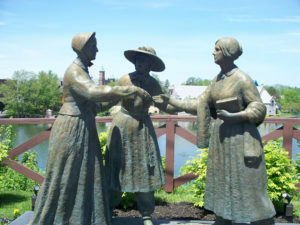 Stanton was a member of the social elite of Seneca Falls; Bloomer was not. Stanton was a freethinker who disregarded the Sabbath; Bloomer was a devout Episcopalian who attended church twice each Sunday. I would have been happy for either of these women to move into the Elate 8, but I did vote for Amelia. “Let men be compelled to wear our dress for awhile and we should soon hear them advocating for change. ” This is my thought annually, having my mammogram. Looks like the Bloomer is covering the Fanny. It was waiting to be said! Thank you! Hahahaha! Oh, come on people! What self-respecting Whiskipalian could vote for an advocate of temperance? As much as I admire Amelia’s political truths, the long-lasting hymnody of Fanny rings true. Fanny for the win! I went with Amelia Bloomer, even though I believe God is OK with our having cake with brandy in it. Today’s parallel to the alcoholism Bloomer was striving against would be opioid addiction. We need both music and healthcare in our world, and universal enfranchisement. Having voted for Amelia in the first round I am sticking with her. She sounds as if she would be immense fun, witty and opinionated, an ideal dinner guest. Both are strong women with deeds and achievements to recommend them, and both have a documented history of firm-grounded faith. This choice is difficult. I do think alcohol has its place in some recipes. We make coq au vin, not coq au eau, and fruitcake keeps better (and tastes better IMHO) with a slug of brandy in the batter and more sprinkled over the cake. However, it’s not that difficult to cook without it if you are cooking for someone who can’t or won’t consume alcohol. Amelia was right on that count. While I don’t much agree with the temperance movement, I’m going for Amelia. If American winemaking had been then what it is now she might have changed her mind! I remember being allowed to wear pants to school only in the winter, so the fight for pants was not yet won even during my lifetime. And Handel’s loss to Fanny still stings! When I was a college student, more than 50 years ago, I was allowed to wear pants to class one time in four years, when the Dean of Women decreed that because the temperature was minus 28 degrees Fahrenheit that morning, women could wear pants instead of a skirt that one day. Although I have a sentimental attachment to Fanny’s hymns and voted for her the first round, I voted for Amelia today. I just happen to feel especially feisty today, and her remarks about women’s equality resonated with me. I did remember that she was a devout Episcopalian. Sometimes people have to take extreme positions, such as no booze in the recipes, in order to be heard and to achieve something. Well said regarding dress. Until I was a junior in high school, girls were not allowed to wear pants to school. Hard for younger women to imagine this. Also, I agree the comment that opiate addiction addiction is today’s comparison for alcohol use. “A gift of song is a gift of love.” Those old hymns are a gift to my soul. So I voted for Fanny J Crosby. I think Ms Bloomer was pretty uptight (no brandy in plum pudding? ), so I vote for JOY over stern austerity. I could not vote for Fanny first round as not even the best of gospel hymns could outweigh the Messiah. And music is a very important part of worship for me. But I did vote for Fanny this time. Amelia fought for social changes, but if we choose saints for spirituality, then I would had to go with Fanny. Blessed Assurance is fine, but she wrote some other hymns which I like much better and might not be as annoying to those who express a distaste for gospel hymns. Check out Near the Cross and especially the beautiful To God Be the Glory. I really like them both! But Fanny gets my sentimental vote today. I do love music, but I love faith put into action for social justice. And I like wearing pants and am a Leon County poll worker during elections. Go Amelia! I vote for Bloomer. Here is the problem: “Deuteronomy 22:5 “A woman shall not wear a man’s garment, nor shall a man put on a woman’s cloak, for whoever does these things is an abomination to the Lord your God.” The introduction of “bloomers” by Amelia caused some problems. For example, “Some young women were denied church membership for wearing the (“Bloomer”) dress.”, New York Daily Tribune, reprinted in Lily, July 8, 1851, p. 6. Problems continute to this day. “A United Airlines gate agent barred two girls from boarding a flight Sunday morning because the girls were wearing leggings.” See what Amelia started!! You go girl!!!!! I have yet to see someone in public wearing leggings without a mid-thigh or longer top on who did not look underdressed (and often overweight). For my mother-in-law, whose life we are remembering and celebrating this week, who lost her vision (one of the last things she did before her vision was completely gone was to re-read the entire Bible) and was so looking forward to receiving new eyes, and who loved the old hymns . . .
For my multi-lingual church in which “Blessed Assurance” is one of the few hymns that all of us know in our own heart languages and can sing in one voice . . . The adolescent male (my wife tells me this phrase is a redundancy) in me has to note the pairing of Fanny with Bloomer. Both gifted women who put their faith into action. Just because I’m more familiar with her story, my vote goes to Ms. Crosby. I truly appreciate the contributions Amelia Bloomer made to the women’s movement and admire the strong stand she made on issues surrounding equality for women. I am a grateful recipient of her work to secure equal rights for women under the law. I also admire Fanny Crosby for her incredible faith and her earnest lifelong desire to share it with the world through her hymns. I am also a grateful recipient of her work to invigorate Christianity by penning songs about Jesus for a hurting world. Because Fanny’s lyrics have and continue to spread the Gospel so beautifully, she gets my vote. Her songs are indelibly etched on my heart and I commend this song of praise to you today – vote for Fanny!!! In a class on Anglicanism taught by Archbishop Carey at Notre Dame, he declared that he mentioned no women in his discussion of our history and life because no women had done anything worth mentioning as Anglican leaders. I responded by writing my research paper on a British woman whose hymns had been much more popular (and undoubtedly more effective in promoting her theology) than any male theologian he’d spoken about. In honor of unnoticed (by archbishops, anyway) women who have been there in Anglicanism all along, teaching and leading, I voted for Fanny Crosby. Marjorie, I’m sitting here all but speechless at what Archbishop Carey said. I love your response – practical, to the point and incredibly powerful. What did he have to say about your paper? Do you have what you wrote in electronic form that you could share? So proud of you. You were presented with ignorant arrogance, yet you persisted! Diana – Archbishop Carey gave me an A on the paper, but didn’t seem to realize that I was responding to his assertion that women had never contributed anything to Anglicanism. Reminds me of seminary, where ECW was never mentioned in class, but the wives of male students worked together to prepare for the power they expected to have in ECW as clergy wives. Invisibly, of course. Guess which seminary I attended! Marjorie, you are a brave woman! Elizabeth I might not have been amused about her contributions to Anglicanism (i.e. the Elizabethan Compromise) being ignored by an Archbishop of Canterbury. Had to go with Amelia, whose strength and character helped to change things for the better for women. A trailblazer during very hard times. I think we can bolster our own stregth through her example during these hard times of division and heartlessness in our politics. Such a hard choice. Love “Blessed Assurance” and love Fanny’s faith, but have to go with Amelia for saving us from restrictive clothing and for advocating for women. In the days before there was an income tax, the federal government made most of its money in taxing alcohol. The result of that was what triggered the whole temperance movement, and subsequent ban on alcohol. So I don’t blame Amelia for being against booze. She’s my choice. I don’t find any of Fanny’s hymns in my hymnal , which is very old. Though a “high” Anglican and not a lover of evangelical-type hymns, I prefer Fanny Crosby for NOT being part of the Temperance Union and its various tenets. In another era I might have picked Fanny, but right now, the idea “perfect submission” is on the rise in distorted and awful ways; our call in this time and place, is to be fighters like Amelia rather than pietists like Fanny. Never mind that Amelia’s zeal, directed at alcohol, led to the horrors of prohibition. Today, I imagine, with that lesson available, she would attack it in less clumsy ways. I have seen what alcohol did to someone in my family, and to that person’s marriage; and what happens when marriage to an alcoholic is combined with “perfect submission” to what is falsely cast as God’s will — rather than intelligent self-preservation in the name of justice. Went with Fanny, but have no trouble with Amelia going all the way. Still looking for the other names Fanny had to use to get all her hymns published. Would love to see a hymnal of all of Fanny’s hymns. Fannie Crosby’s hymns reach the evangelical hymn lovers as well as SOME high church Anglicans ! I still get chills singing/hearing VICTORY IN JESUS (NOT FANNIY’S) and the last line: “He plunged me to victory beneath the cleansing flood.” Hoo Boy ! Just saw a High Churcher cross herself and mutter something in Latin ! Aleathia, thank you for reminding this high church Anglican (Southern Baptist raised) of that wonderful hymn. “O victory in Jesus, my savior forever”! Scott and Tim, you are examples to us all. Your hard work of reconciliation is a true sign of grace – and whiplash. From total breakup to a resurrection of the SEC team in three days is – well – all but unbelievable. Fortunately there are precedents. I’d use the A-word, but it’s still Lent. Fanny is still my favorite and I’m sad that she will likely not make it to the end! Still she’s a Golden Halo winner in my book! I had to vote for the Temperance leader to honor my mother, who devoted much of her life to teaching young people the value of temperance so their lives would not be destroyed as had the lives of her brothers. Even though I am a musician, I am more in the Classical tradition and do not care for the gospel hymns. Plus, belonging to a church with 2 female pastors, I feel we owe Amelia a great deal. Amelia gets my vote! Thank you for that link, St. Celia. What a marvelous rendition! I finally got the video to show in the text box! Oh thank you so much for the song. So beautiful ! Giving women a “voice” wins my vote! Accolades for Amelia! After looking into Fanny’s bio more deeply on my own, I had to go with her. She not only had sexism to deal with (inferred), but ableism as well. And she took it in stride. Luckily, I won’t be too devastated if Amelia wins as I hold her in high esteem and owe her much. Hard choice. because I love hymns and hymnwriters, I am voting for Fanny this time around. Whether Amelia was outwardly religious or not, she worked for equality and justice. When my grandmothers were young adults, they could not vote. My mother was born before women could vote. Amelia get my vote. My first name is a traditional family name, but my middle name of Carol, is not. When I questioned my now-departed mother why Carol, she responded that she always wanted me” to have a song in my heart”.In her memory and honor I voted for Ma. Crosby. I can’t help but think how pleased Bloomer would be that so many churches sponsor AA (and NA, etc) groups (while she’d probably be working to reinstate prohibition). LOL, Margaret. You’re probably right on both counts. Tough choice today. I will be happy with either saint moving to the Elate Eight. Actually hear Fanny Crosby’s voice found on wax cylinder recording. Book and CDs called Waxing the Gospel! Amelia Bloomers is my gal…also – where is the statue that is shown ??? Voted for Amelia Bloomer this time, because of her strong advocacy of women’s equality. I also had large problems with Ms. Crosby’s hymns. Yes, they’re written to catchy, heart-warming tunes, but I think the words of what we sing in worship are also as important as the tunes. Do we really believe that a Jesus-shaped God would consign people to be fuel for an eternal BBQ … just for getting their theology wrong? Do we really believe that a Jesus-shaped God would demand a substitutionary blood sacrifice as the only alternative to being fuel for an eternal BBQ? These are the messages that Ms. C.’s hymns convey. I believe that God is Love … radical, unconditional Love! I see Ms. C. as putting far too many conditions on God’s love. Sentiment can be treacherous, but sometimes I see it a a God-given guide when decisions are tough. When I thought of “Blessed Assurance I remembered my devout father-in-law, whose love of “Blessed Assurance ” prompted my equally devout but also liberal, service-oriented husband, John, to request it for his funeral. And in proud continuation of John’s advocacy for persons with disabilities. our granddaughter Moira, eight years old, just taught herself Braille so she could teach blind children. Thanks be to God! Wow! Moira is impressive, Mary! Oh I’m so disappointed! Although Amelia is a worthy soul, my heart and vote was for Fanny. Her saying “the first face [she] would see will be that of Jesus,” brought tears to my eyes. And Blessed Assurance remains my favorite hymn. What a love-filled beautiful soul she was! This was an easy choice for me today. I wish I could vote more than once for Amelia. She did so much for women. Also known as “the Beatific Vision”. I started reading those words and started singing them. That said (or sung), I had to stick with Amelia. She’s a gal whose actions captured my heart! Grateful beyond measure for the incomparable efforts of Amelia Bloomer. Yes, she truly is a saint. However, the God-inspired words given to Fanny Crosby for hymns that speak to the soul cause me to vote for Fanny. I’m a church organist, who didn’t grow up singing Fanny’s songs in my Episcopal church. However, somewhere along the way, I married another organist (Episcopalian) who grew up Southern Baptist. I learned from him to cherish the hymns of Fanny Crosby. Now, playing for a small UCC congregation, I have personally witnessed the transforming power of her songs. Yes, a Lutheran college in the early 60s–skirts only. Thanks, Amelia (although it took awhile for my college to catch up). I was blind, but now I see. I get Amelia’s importance, but Fanny Crosby has my heart. Amelia. For my Great Great Grandmother Mary Jane Williams who had ten children and was a member of the WTU. Also because , as a woman and a feminist I owe so much to the Suffragettes! My name is Zoey and I really like Amelia because she wanted women to be considered equal. I like that a lot. Zoey, that is a wonderful reason. I’m glad you are voting and I’m glad you are telling us why you vote the way you do. You will grow up to be a strong and equal woman, too. Zoey, that is a wonderful reason! You are going to grow up to be a mighty woman! Inspired by the debate over temperance, I remembered that last year we were given a recipe for a “Yellow Fever” cocktail in honor of the nuns who fought yellow fever in the south. Believe it or not, there is a “Suffragette” cocktail from 1909, and I have paired it with a 1920 non-alcoholic “prohibition classic,” so that we may continue to debate theology in a civilized manner. For those “equally attractive non-alcoholic options” required by forward-thinking dioceses and vestries, try this simplified peach syrup from Bertha Stockbridge’s 1920 prohibition classic “What to Drink”: simmer 10oz of peach slices with 8oz of water and 8oz of sugar for 30 minutes, then strain. Whichever option you choose, know that you’ll be invigorated to debate the trinity with St. Athanasius (old “Contra Mundum” himself, whom we denied the Golden Halo previously). Enjoy. Though we might not be eating meat or chocolate during Lent, no one said we couldn’t have a cocktail. I may have to try that! I may also put it up on my cookbook blog, if it’s okay with you, St. Celia. You have forced me to cite my sources! The Suffragette cocktail comes from this source: https://vinepair.com/booze-news/suffragette-cocktail/. Note that the article was published online Nov. 7, 2016. (No pre-election sub-tweeting going on there!) The second one comes from an article in the Guardian on temperance-era drinks: https://www.theguardian.com/lifeandstyle/wordofmouth/2016/feb/11/alcohol-free-why-temperance-drinks-are-making-a-comeback. Help support the Guardian! Thank you! Both are bookmarked, and will be blogged as soon as I’ve tried them. I voted Crosby. I summed this up to a coworker as “Bloomer doing worldly work for God, versus Crosby doing Godly work for the world” My opinion is that the latter is greater. As the daughter of one alcoholic, the sister of another and acquainted with many others both active and recovering, I have a lot of sympathy for the heart behind the Prohibition movement. It didn’t serve its purpose, addiction and greed being what they are, but the goal is understandable. That being said, I’m still awaiting a last moment surge of genuine votes for courageous, vulnerable, feisty, loving songwriter Fanny Crosby. This was a conundrum since I voted for both ladies in the first round. While Amelia did great things, mostly she worked in the political realm. Fanny’s hymns were great works of faith. So I voted for the lady of faith. I didn’t think this would even be a contest. Fanny’s hymns has touched so many lives. My husband wanted Fanny to go all the way. He was brought up singing her hymns. Another tough choice! Amelia for me as I see her work as still needed in many parts of the world.